☀ BIGGEST PICNIC: 1000 participants!!! Along with many international organizations: Couchsurfing Paris, Paris Events, Info Erasmus, Au pair Paris, YEP Youth Events in Paris, Polonais à Paris, Cosmopolites in Paris ... (list below). Directions: RER B or Tramway T3 stop 'Cité Universitaire'. 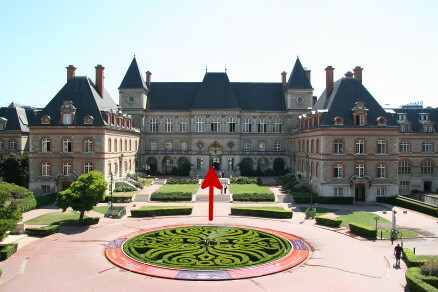 We will be in the center of the large lawn directly behind the Maison Internationale starting at 1 pm. Accès: RER B ou Tramway T3 arrêt 'Cité Universitaire'. Nous serons au centre de la grande pelouse qui est derrière la Maison internationale à partir de 13h00. We will be in the center of the large lawn. 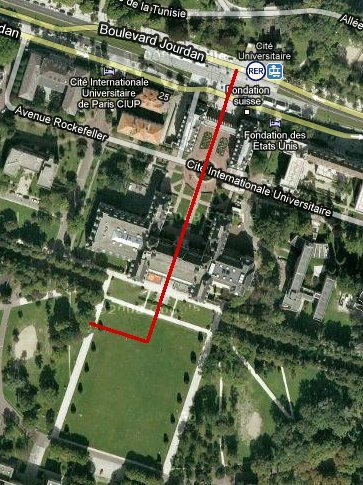 If the sun gets too strong, like this sunday 16/8, we will move to the shade to the right of the lawn (coming from the main building, see photo). Nous serons au centre de la grande pelouse. Si le soleil devient trop fort, comme ce dimanche 16/8, nous déménagerons à l'ombre à droite de la pelouse (venant du bâtiment principal, cf photo). You can check the weather forecast here, but don't trust it - Bring your sun screen, hat or cap! J'espère qu'il y aura d'autres dimanche de meeting comme ça, je ne peux pas venir aujourd hui.. SOunds like a cool picnic! I will go to Italy the week after this picnic. Some Italian speaking person in Paris who would like to help me a bit with some basic prononciation, conversation? Ciao Ingeborg! I you come to this HUGE picnic, no doubt you will find PLENTY of Italian native speakers! BENVENUTA e ci vediamo domenica!! C'est à 1 ou 3 PM ? Il y a deux infos contradictoires dans le message.